We own 4 medium-rage routes with a length of 19 to 24km, starting from the lake and taking us to such different places like the Tenalla ravine, Mines de Ferro or Mas del Peraire. We underline the monumental trees route that will allow us discover the Pi Gros or Faig Pare, two magnificent speciment of its kind. The Volta a la Tenalla has a high natural, geological and ethnological value. You will discover the Tenalla, Fredes (a small village) and Portell del Infern. The route goes through a part of the old brindle path between La Sénia in Catalonia, and Fredes in Valencia. In addition, it also goes through the natural road between Fredes and El Boixar, which now is part of the GR7 trail. This route is available all year, and in Fredes there is a bar and a source of drinking water. In winter you should take into account the weather conditions, as it can be really windy over there, so you should make sure you are well equipped. The snow can be a problem as well, so the weather forecast should be checked in advance. In order to get to the starting point, you should go to Ulldecona Lake and go along the forest track that starts next to the bridge for 2 km. At the start of the route there is an esplanade and ‘Fredes’ traffic signs. You will start the route from an uphill part of the track until you will find the Portell trail some hundreds of meters ahead. The route keeps on being uphill through the Estrets de la Ronyosa and Solà d’en Brull until you will get to Coll del Ferri. At this point the route changes from the Portell path to the Barranc del Teutalí, below the Serra de la Borulla. An amazing trail for running will lead you to the Palmereta. Almost 400 m+ will keep you apart from the trees that you will cross to follow the Font de la Figuera trail. At the highest point you will find a trough that, normally, springs water. You will follow the same path until the Mas Nou, where you will cross the road again in order to link to the GR7. You will then follow this one for some meters until you will get to Fredes. Once there, you can take water from the fountain, eat at the restaurant or rest for a while. 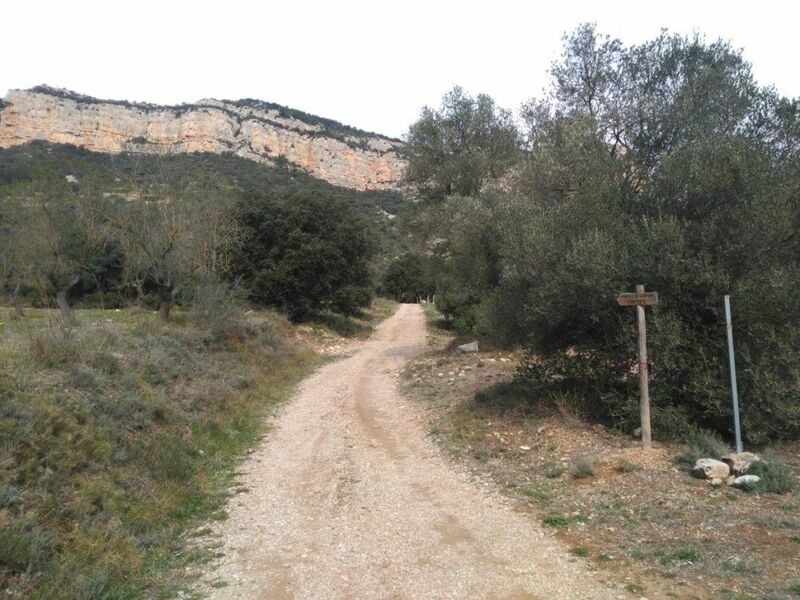 From Fredes, you will take the old path that will lead you to La Sénia and when you will get to Font del Teix, you will follow the PRCV 75-2 that goes to Salt del Robert. Later, you will go down the path in Barranc del Salt. Once you get down, you will get to Salt del Robert, a 30-meter-tall waterfall and a declared flora micro-reserve. Keep on going down following the same path until you will turn right and follow the Cubanos trail, which will lead you to the lowest point of Portell del Infern. In these limestone walls you will find Ports endemic spices, such as the large-flowered butterwort or dragon flowers. If you are lucky, you may also see Spanish goats and enjoy the vulture’s flying. Finally, you will come back to Coll del Ferri through Mas Joan. Water: By the different villages that you pass. This route is a clear example of the awesomeness of the nature out of the known zones. In this little corner of the world you will find beeches, yews, black pines, boxwoods, hollies, hazels, white beams and wild pines. All this, a few kilometres from the Mediterranean Sea. Of all these kind of trees, you will be able to see two heritage ones: the Faig Pare (a beech) and the Pi Gros (a pine). Faig Pare is a specimen that seems out of a fairy tale. It is approximately 300 years old. Pi Gros is a specimen of a black pine of epic proportions and it is approximately 700 years old. In order to get to the starting point you will need to start from la Sénia to Ulldecona’s Lake and follow the forest track of la Fou for 9 km. You may park your car at the starting point of Els Ports Natural Park routes. The route starts counter clockwise: you will undo the track that led you to the starting point and you will find the start at Racó del Tabac. There is a long, steep and constant climb that will take you to Plans de Valldebous, a point that unites several paths, specifically the Rossec old path, from which used to descend the old rossegadors. That job has disappeared, but it used to consist of finding the best pines in the area of which making furniture and tools. They cut down the pines and transport them with the help of their animals until they get to La Sénia. You will continue to the left, following the PRC 82 and going to Mola del Boix. After, you will go under it, you may visit the Teixet, a yew tree that it is not a monumental tree but is worth a look. Some meters ahead you will get to the Vallcaneres Altes forestry path. You will follow this path until hiking down. Then, you will continue along the path and you will see the Fageda del Retaule. After that, you will take the PRC 95 and you will get to the Faig Pare. You can take some photos and afterwards follow the Retaule path until you find a trail and a fountain of the same name. There, you can drink some water and enjoy the views that you will probably remember for life. Following the path you will find the climbing to the Pi Gros. You will be able to go up to see it and once you will be done, you will have to go down again. You should keep on the same PR until you will find the Collet de l’Herbassana. Once there, you must pay attention as you have to follow the path that passes in front of the “door” you find in the forest track. Later, you will get on a steeply downhill to the Barranc dels Cirerers, and right after, you will pass below a few spectacular caves until you get to the Fou track again. You have to keep on going down along the same path until you will get to the Font del Teix, where you turn back on the path to Cova dels Bous. Once there, you turn left to get to Barranc de les Tosques and later to Barranc de la Cova passing the cave with the same name. The highest point of this track will be the Portella de la Malladeta, from where you can see the Pont Foradat just in front of you: a one-of-a-kind masterpiece result of the karstic soil erosion. Finally, you get back to the Àrea de lleure de la Fou where you can enjoy the views. Water: Some sources along the route. The Volta a les Mines de Ferro is a route that is available all year long. On the route, in the village of Ballestar where there is a bar and also find water to drink. During winter, you should take into account the weather conditions, as it can be really windy over there, so you should make sure you are well equipped. Snow can be a problem as well so you should check the weather forecast in advance. The path starts behind Molí l’Abad’s tourist complex nearby Ulldecona’s Lake. You follow the green marked path until the firewall that will lead you to the Tinença Natural Park. You will climb an opened and irregular path. Once you get to the top, you should turn right and go straight to a defined path. You will keep on going up and you will see the Mines de Ferro and finally, you will see a metal fence. You should then follow the path that will lead you to Moleta del Terme, by combining sections of this route with paths. You will see El Ballestar (a small village) at the end of the ravine and you will start climbing down the Galins trail. Once you get at the lowest part if you turn right you get through the Estrets del Ballestar. A few kilometers ahead you will get to the Forn del Vidre, an old farmhouse that currently houses three public buildings (Viver Forestal, the wildlife recovery centre and the Natural Park brigade warehouse). From the grounded bridge that crosses the Ulldecona Reservoir in the Forn del Vidre, if you turn right you may follow the Natural Park marks. Once there, it’s on you getting to the starting point or keep on climbing and going to Moleta del Terme. Once you will get to the top, you will go through a short part of the path where you had already been before and you will start going down until the starting point enjoying the views. The Volta al Mas del Peraire is a route that is available all year. In winter you should take into account the weather conditions, as it can be really windy over the area, so you should make sure you are well equipped. Snow may be a problem as well, so the weather forecast should be checked in advance. In Fredes there is a bar and a source of drinking water. 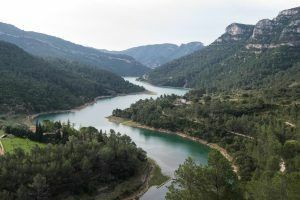 In order to get to the starting point, you should go to Embassament d’Ulldecona (Ulddecona Lake) and walk along the forest track that starts the very 2 km next to the bridge. At the start of the route there is an esplanade and the ‘Fredes’ traffic signs. The route starts from an uphill part of the track until you will find the Portell trail some hundreds of meters ahead. The route keeps uphill going through the Estrets de la Ronyosa and Solà d’en Brull, until you will get to Coll del Ferri. Keep on going through the path that leads to Portell de l’Infern, an amazing natural pass through a rock. From there, you will be able to see gamellons (traditional water fountains made of empty logs where there is filtered water from the rocks) and enjoy the best views of Tinença de Benifassà Natural Park. A few meters ahead you will find signposts that tell when you will start climbing down. That path will lead you to the end of the ravine from where you had been able to see the views from the Portell del Infern. Once you get down, you should turn left to the path that will lead you to Salt de Robert. Before getting there you should change your way to a path that will lead you to Mas del Peraire. When you will cross the little ravine you will start going up to get to that historical farmhouse, which altitude is 1.200 m.
Unique interlocking thanks to the maintenance of its flora and vegetation. Recently, it has become a mountain refuge with scientific purposes also as a biological reserve, promoted by Fundació Enrique Montoliu, who owns this farm since 1997. You will them follow the path that will take you to the Tossal d’en Cervera, once there, you will go through the path that will lead you to the Negrell and you will start going down through the path that will take you to Refugi de la Font Ferrera, a refuge that has been operational since 1997. You will then follow the track GR7 that will lead you to Fredes. Once in Fredes you can either drink or eat in the restaurant, and take water from the fountain. You will go from Fredes through the old path to La Sénia but when you will get to Font del Teix you will have to change your way and go to Portell del Infern. After that, you start climbing down until you will get to the car, going again through Portell del Infern. Water: In the village of Fredes there are fountains and bars.